Scotland has over 790 offshore islands, most of which are to be found in four main groups: Shetland, Orkney, and the Hebrides, sub-divided into the Inner Hebrides and Outer Hebrides. There are also clusters of islands in the Firth of Clyde, Firth of Forth, and Solway Firth, and numerous small islands within the many bodies of freshwater in Scotland including Loch Lomond and Loch Maree. The Inner Hebrides (Scottish Gaelic: Na h-Eileanan a-staigh - the inner isles) is an archipelago off the west coast of Scotland, to the south east of the Outer Hebrides. They are part of the Hebrides. In classical sources, they are referred to as the Ebudae or the Ebudes. Traditionally, the Inner Hebrides have been subdivided into two groups (northern and southern). The Hebrides began to come under Norse control and settlement already before the 9th century AD. The Norse control of the Hebrides was formalized in 1098 when Edgar of Scotland formally signed the islands over to Magnus III of Norway. The Scottish acceptance of Magnus III as King of the Isles came after the Norwegian king had conquered the Orkney Islands, the Hebrides and the Isle of Man in a swift campaign earlier the same year, directed against the local Norwegian leaders of the various islands. By capturing the islands Magnus III subdued the Norsemen who had seized the islands centuries earlier and imposed a more direct royal control. The Norwegian control of both the Inner and Outer Hebrides would see almost constant warfare until being ultimately resolved by the partitioning of the Western Isles in 1156. The Outer Hebrides would remain under the Kingdom of Mann and the Isles while the Inner Hebrides broke out under Somerled, the Norse-Celtic kinsman of both Lulach and the Manx royal house. Although the Inner Hebrides, from 1156 known as the Kingdom of the Hebrides, still nominally was under the sovereignty of Norway, the leaders were Scottish in language and culture rather than Norse. After his victory of 1156 Somerled went on to two years later seize control over the Isle of Man itself and become the last King of the Isle of Man and the Isles to rule over all the islands the kingdom had once included. After Somerled's death in 1164 the rulers of Mann would no longer be in control of the Inner Hebrides. 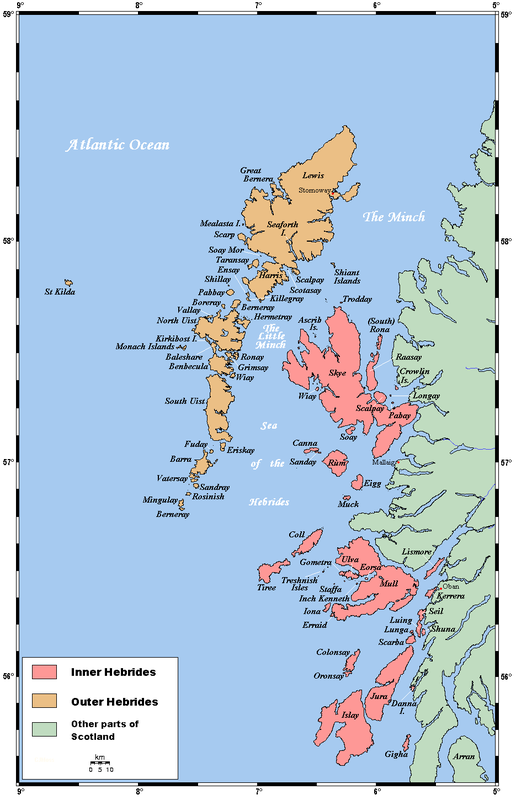 The Lord of the Isles would continue to rule the Inner Hebrides as well as part of the Western Highlands as a subject of the King of Scots until John MacDonald, fourth Lord of the Isles, squandered the family's power away. Through a secret treaty with Edward IV of England in 1462, he planned to make himself more or less an independent ruler. When James III of Scotland found out about the treaty in 1475, he forfeited MacDonald's lands. Some were restored for a promise of good behaviour, but MacDonald was unable to control his son who defeated him at the Battle of Bloody Bay (Mull, 1481) and his nephew whose rebellion in 1493 provoked an exasperated James IV to forfeit the lands for the last time in 1493. MacDonald died in 1503.